This is the long overdue fairy story I talked about last year. It actually doesn't have an end currently so I'll be only posting half of it. Enjoy! greedy, kiy. Which in their speaking language it pretty much just means vermin. There are fairies who were brave enough to go into the human land but they rarely visit. When they do they all always have stories to tell us but they always sound so awful. Right now in a big hollow tree, where the king lives, three fairies have been called forth to help the king out. The three fairies standing before the king all gasp. Rose, the youngest and smallest of the group, looks a bit worried at hearing this. In turn they each nod, yes. “Great! Well then you may be on your way! I hope to see you very soon.” The king says dismissing them from the room. The three-some leave. They start their journey immediately. As they are flying through the long forest the youngest fairy, who is wearing a black cloak which makes an air of mystery around her, was the first to speak up. “So since we are going to be traveling together for awhile why don’t you tell me your name? I’ll go first. My name is Rose.” Rose say smiling over at the two other fairies which are both boys. The older but not tallest fairy was the first one to speak up, “My name is Aelius. I’m 200 years old. I can control the element earth.” He makes a couple of small rocks spin around next to him. “Well your name might be Overlord but you aren’t going to be bossing me around!” Rose says a little snarkily. “Hrmp!” Rose says and calls up a big wind and shoots past both of them to where they couldn’t see here any more. “Come on red, we better catch up to her.” Aelius says calling Overlord by the color of his hair. “Well, no more wondering what her element is.” He looks slightly impressed by her power of wind. Wind was the second most rare element to have. Fire was the first. If you were to combine two fairies with the element fire and wind they would be one of the most powerful fairies. Aelius and Overlord both flew as fast as they could to catch up with Rose but it seemed she had disappeared. They were about to give up on Rose and just go to the city by themselves when they heard a high pitched scream. They both gave each other a worried glance then quickly flew off toward where to scream had came from. When they arrived at the scene they found Rose stuck upside down in a big spider web. They watched then both broke out into fits of laughter at her struggle to get out. This just made Rose yell out in frustration as she tried different ways to get out of the sticky web. She try to use a big gust of wind to push her out of the web but, all it did was fiercely shake the web. By the vibrations of the web the web’s owner came out. The big spider slowly walked towards Rose and, Rose being scared of spiders, started freaking out. Aelius, noticing Rose panicking, decided to help her out. He quickly flew up to her, grabbed a hold of her hands and pulled until she was free. When she finally got unstuck she ended up flying through the air and Aelius lost his grip on her. Before she crashed into the ground she summoned a small bust of air to catch her, then gracefully floated to the ground. Aelius and Overlord flew down and landed next to her. Overlord was still laughing his head off but Aelius looked a bit worried about her. “Oh that,” Rose said looking away and putting one hand through her hair to smooth it out but find it get stuck. Shock registered across her face when she realized that the sticky web had gotten into her hair. She pulled her hand out of her hair and looks at the little bits of webbing she pulled out. “Here let me help you with that,” Aelius says and helps pull out the web from Rose’s hair. Once the webbing was out of Rose’s hair they continued on their mission. Rose was always flying slightly ahead of the boys. They had been flying for a couple hours now and nothing much had happened. It looked like nothing even would happen for the rest of the trip but that’s where they were wrong. Overlord was getting tired and bored so he started swooping down, grabbing a rock or something, fly back up to the group and would throw it as far as he could. “Nah, I won’t. Also call me Pansycake!” Overlord said. “Okay..., but what about Overlord?” Rose asked. “I want to be called Pansycake!” Pansycake said starting to yell. Pansycake went back to throwing rocks. One he threw hit a tulip that was nearby. There happened to be a bee in the tulip. He did not appreciate having been jolted around by being hit with a rock. The bee came out of the flower and stinger ready, got ready to attack whoever messed with him. Of course being only about 3 inches tall the bee was huge compared to them. They happened to fly over the tulip before the bee came out so they couldn’t see it sneaking up on them. Fortunately Rose happened to look back and see the bee approaching. “I would of course pull out a chainsaw and chop them up into little pieces!” Pansycake says enthusiastically then proceeded to laugh like a madman. “Well,” Rose says coming to a halt in her flying, putting her hands on her hips and facing the boys, “Here’s your chance now.” She says pointing behind them. They both turn around to see the bee not that far behind them and approaching fast. Pansycake took one look at it, his face fell and his wings drooped down a bit. He then as quickly as he could flew away and hid somewhere in the forest. Aelius didn’t look too thrilled either but he got ready for the attack. Together Aelius and Rose fought the bee with the elements earth and wind. It didn’t take long before the bee finally gave up and left them alone. The whole time Pansycake never showed back up. Just then Pansycake flew back into the scene. Frustrated and out of words Rose just flies too and of course fly ahead of everyone else. Aelius didn’t say anything but continues on too. Once the reach the edge of the forest, where the human land is not that far, everyone decides to take a little break. By now the sun is getting low so if they hurry they’ll make it before the sun sets. Rose, finding that she is hungry, scavenge around for something to eat. She finds some blackberries, picks three and take them back to the others. Aelius was sitting on a rock and Pansycake was up high in a tree staring off into the distance. Rose hands everyone a berry then she walks over to a tree, sits down and leans against it. Upon her first bite of her berry she got juice squirted all over her face. Pansycake happened to look at Rose at that moment and broke out into laughter. “This is not my day!” Rose mumbles. She gets up and finds a leaf to wipe her face off. “Oh that,” Pansycake keeps looking off into the distance, “Nothing of importance.” He says waving his hand to dismiss the subject. “So, after this we will be in human land.” Aelius states. “Guess so.” Rose says a bit disappointed. “I think it will be awesome! We could pull pranks on all those measly underlings!” Pansycake says excitedly looking over to where Rose and Aelius is sitting. “Well that’s just mean. Just because they are kiy doesn’t mean you get to torture them!” Rose says giving him the famous disapproving look. “NO! And that's the end of that!” Rose snaps at Pansycake. Aelius snickers at Pansycake’s look of total surprise. “Well now that that’s settled let's finish this already.” Rose says. Everyone gets back up and flies towards the human land. When they arrive it was a bit of a shock with people being EVERYWHERE! They kept a low profile while trying to find at least one fairy. Rose kept to the shadows, sneaking around. She had her cloak wrapped tight around her and the hood up to cover her face. It took about 10 minutes before they found any fairy. When they did the sunset was almost all gone and it was getting dark. “PLEASE! Just once!” Pansycake pleaded for about the 50th time about pranking a human. “Why not? !” Pansycake asked in a whiny voice. “BECAUSE! If you-” Rose started but was cut off by Aelius. “Hey, look! It’s a fairy!” Aelius said pointing. Sure enough it was a fairy and they all made a mad dash for it. 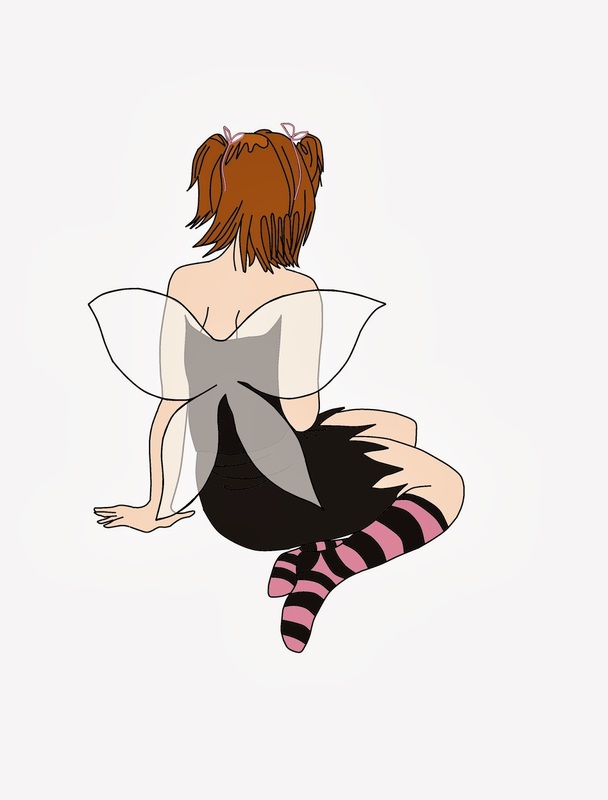 The fairy seeing three other fairies rushing for her kinda spooked her and she started to fly away as fast as her wing could carry her. “No wait!” Aelius yelled but the fairy was too far away to hear him. Rose, being a smart fairy, used her element wind to her advantage. Using it to speed up she was able to catch up to the city fairy and even accidentally surpassed her. She quickly backtracked till she was right the front of her. “Where do you think you’re going?” Rose said. The fairy halted before flying into Rose. “YIIII! THE GRIM REAPER IS COMING AFTER ME! !” She screeched. Well you do have to admit it kinda looked like that. Rose was covered in a black cloak and the hood goes over her face so you couldn’t see her eyes. “Whoa whoa! Calm down” Rose said and pulled the hood down so she could see her face, “We just need your help” Rose said motioning to the to guy fairies who were still trying to catch up. The fairy take a deep breath “Oh! You almost got me there for a sec.” She laughs to ease the tension. “Klin, very nice to meet you. So can you help us?” Pansycake says in a rushed way. “Whoa whoa! Why are you in such a rush Klin?” The fairy asked. “I just want to get back to the forest as soon as possible, that’s all.” Klin says not really making eye contact. “Oh! So you guys are forest fairies! Fine, I can help you. I know about almost every city fairy there is!” The fairy replies. “Great! We are looking for a fairy named Margaret.” Aelius says. A little bit of shock registered across her face but it quickly disappeared into a smirk, “Why do you need Margaret?” She asks slyly. “Oh, the king asked for her.” Aelius said. As she lead them around she was so comfortable around the humans while everybody else was still trying to stay hidden. They wouldn’t come out no matter how many times the fairy told them it was fine. She lead them to a restaurant. When entering the restaurant there were humans everywhere pigging out in booths, shoveling as much food as they could into their mouth. This only disgusted everyone but the fairy leading them who acted fine, not even fazed by this. “You guys hungry?” The fairy ask. Everyone nodded so she showed them to a booth to sit down and she left to go get them some food. It didn’t take her long before she returned with a plate full of food. She set it down for everyone to dig in and she went to take a seat herself. As soon as she sat down she jumped right back up and squeaked a little. Everybody looked at each other trying to find out what just happened. Just then a little fairy with blonde hair and wearing a blue dress popped out from behind the booth. “Hi Dinky! I see you're up to your tricks again!” Said the fairy who has been leading everyone around, whose name must be Emmy. “When do I stop? !” Dinky says and sit down next to everyone else in the booth. “Ah, the classic, freeze my seat” Emmy said playfully sticking out her tongue at Dinky. “I’m Rose! Very nice to meet you Dinky.” Rose introduces herself. “I’m Aelius.” Aelius says with his mouth full of food. “And I’m Mantis.” Klin says. “Um..” Emmy looks over at Aelius and Rose for help. Rose just waved her hand dismissing Mintis and his confusing identity problems. “Very nice to meet you all!” Dinky says, “I’m Dinky if you haven’t figured it out already” She says flashing a smile. “Don’t mind if I do!” Dinky says and dig in too. After everybody finish eating it is dark outside and there wasn’t going back to the forest until at least tomorrow. “So where do you think Margaret is?” Rose asks Emmy. “Oh! I have some great stories to tell that will help pass the time!” Dinky says enthusiastically. All the humans got up from their tables and migrated towards an open area. All of a sudden music unlike none other started playing. This startled the three travelers because they had never heard anything like it. Yes they've heard music before but nothing like this. This kind of music was techno and the music the forest fairies are used to are flutes and other wooden instruments. Soft, calming music, not hard rock! The humans were dancing fiercely and not in calm soothing moves, which is the only kind forest fairies knew. “Oh no, not me--” Aelius starts to say but Dinky grabbed him by his hands and pulled him into the crowd. He only had enough time to give a ‘HELP ME!’ look back at Rose and Mantis before he disappeared into the crowd. Emmy grabs one of Rose’s hand and one of Mantis’s hand and pulls them out to the dance floor too. Once out there you could see there were other fairies too, all dancing in the same manner. Rose stays out there to dance but isn’t quite sure about the moves. Mantis, as quickly as he could, flies over and stands off to the side, just watching. Aelius looked like he wanted to get out of there but Dinky had him pretty occupied. Dinky was dancing all over the place but whenever Aelius tried to step off to the side like Mantis, Dinky would swoop down and pull him back out to the dance floor. After a while Rose actually started enjoying the kind of dancing the humans did, Aelius gave up on escaping Dinky and just danced. Emmy was dancing with Rose and Dinky was doing her own thing all over the dance floor. Dinky was doing the moonwalk when she happened to bump into some ropes. She glances up to see where they lead and grins mischievously. Emmy decided to try and bring Mantis out to the dance floor. When she flies towards him she barely had anytime to react as something from up above falls and nearly misses her. “YIIII!!! What was that? !” Emmy shrieks. She then hears some giggling somewhere off the side of the dance floor. She looks over to see Dinky laughing her head off and holding rope. “DINKY!!! I should've known it was you!” Emmy points an accusing finger at Dinky. Dinky just burst into harder laughter. Some of the other people and fairies join in on her laughter. Dinky, through laughs, speaks, “You... haha... Should've seen...heehee... Your face! !” Then she burst into more fits of laughter, falls to the ground and lays there laughing. After a little bit everything resumes back to the way it was. Emmy couldn’t convince Mintis to join in on the dancing so she just went back to dancing with Rose and Aelius.